The Kelvin K2 uses the latest Bluetooth 4.0 wireless connectivity, combined with recent advances in aerial technology, to send the temperature information to your smartphone (often from inside your refrigerator) . The free iOS or Android app then monitors your wine as it is chilling and provides as much or as little information as you need to get the best from every bottle of wine. For most wine drinkers the notion of serving 'chilled white wines' and red wines at 'room temperature' is a common generalization, but the reality is that most serve their whites far too cold and their red wines far too warm which significantly affects the wines flavor profile and of course adversely affects the drinkers enjoyment. The Kelvin K2 Smart wine thermometer has been designed to demystify the process of enjoying your wine with its best possible flavor. The K2 temperature settings are also fully adjustable to take into account the most important wine drinker of all - you. The only opinion that matters when it comes to taste is your own and all the K2s recommendations are fully adjustable and your favorite wines can be served at your ideal temperature time and time again by use of the favorite function. It is a liberating level of control over your wines flavor. Once you start to understand how temperature affect your wine you can emphasize what you like and diminish what elements you don't. Love it!!! Fun to use, very informative, and make a big impact on flavor. I received my product last weekend and tried it over the weekend on a white and red bottle. The app has all the wine bottle options to choose to make sure the right wine is at the right temperature. Worked for both bottles! Highly recommended. 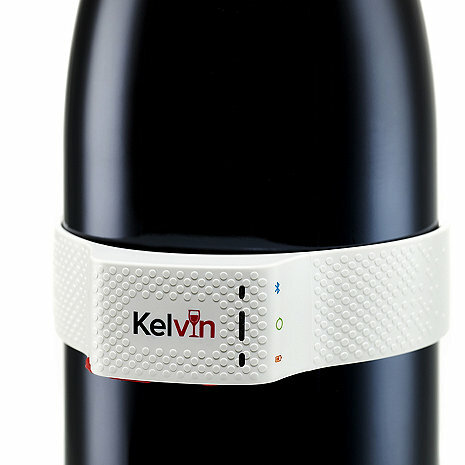 I've always been a fan of serving wine at the right temperature, but Kelvin makes it so much more convenient and accurate. I've been using mine for over a month now and it's been great. The app has tons of wine presets loaded into it (Cabernet, Chardonnay, Burgundy, Sancerre, Barolo etc etc) and finding my wine has been easy for every bottle so far. The Bluetooth works great and I've also been impressed with the wealth of wine knowledge that comes with the app - everything from food pairings to glassware advice. Great product and will definitely be giving some of these to friends this Christmas. Works as advertised: chilling wine is now easy. It tells the perfect range, and I really like this gizmo. As a wine novice, the Kelvin helps me serve like an expert. the right temperature to serve, the right stemware to use and what to expect when we open and enjoy a bottle of wine chilled to the right temperature. Not to mention, my friends love the app as much as I do. really fun and cool to use.